This gallery presents the eleven “Official Disney Princesses” who have graced the screens for the past several decades. It wouldn’t hurt also that the films they appear in should be a box-office triumph to qualify as an official Disney princess. Check our gallery of the official Disney princesses — who range from the quiet, graceful and classy to the strong-willed, fearless, independent and modern — and see if you’ll agree to our list. Princess Snow White has the honor of the being the first Disney princess in its first full-length animated film Snow White and the Seven Dwarfs, released in 1937. The character and the story were based on a fairy tale by the Brothers Grimm Sneewittchen, which was published in the mid-19th c. In the Disney film, Snow White is a young, beautiful girl who is living with her stepmother who is jealous about her stepdaughter’s physical fairness and beauty. So the evil stepmother hatches a plan to kill her. Snow White’s true love is, of course, Prince Charming, who awakens her from her eternal sleep with love’s first kiss. Of course, there are Snow White’s friends, the Seven Dwarfs. Snow White is the youngest of all the Disney princesses (at 14 years old), not to mention the fairest of them all. Cinderella is Disney’s second princess and the main protagonist of her eponymous film, which was first released in 1950. Like Snow White, Cinderella is based on the European fairy tale which had since undergone many variations. In the Disney version, the story centers on the beautiful young woman who is forced to work as maid — in her own home — for her cruel stepmother and two ugly, jealous stepsisters. Her only friends are the birds and the mice who also live in the manor with her. Of course, she’s the owner of the iconic glass slippers. Cinderella is 19 years of age, and also the first princess to have siblings, albeit stepsilbings. 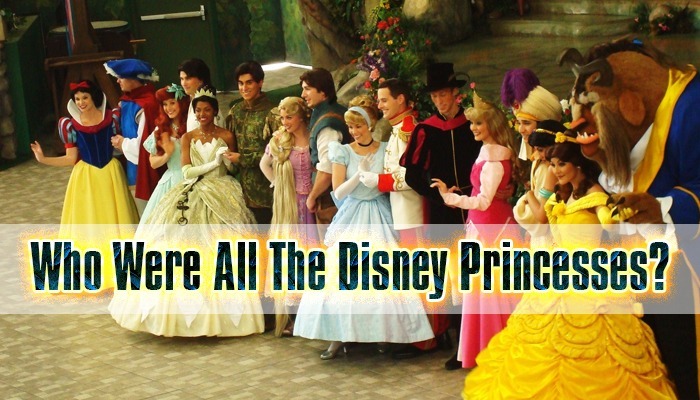 She is also the first Disney princess to marry a royal figure, as she marries Prince Charming. Princess Aurora, the third Disney princess, appears on the 1959 film Sleeping Beauty. The movie is also based on another classic fairy tale involving a beautiful princess, a sleeping enchantment and a handsome prince. The original fairy tale version is actually much darker and a lot more grim. But you know Disney, they altered the story to make it a more G-rated affair. Aurora is 16 years old, and earns the distinction of being the only Disney princess who receives the least amount of screen time and spends most of her appearances singing her lines rather than speaking them. Unlike any other Disney princesses, Aurora has the purest royal pedigree — after all, she was born into royalty and gets married into another royalty. Ariel is the fourth Disney princess and the heroine of the 1989 animated feature The Little Mermaid, the sequel The Little Mermaid II (although the Ariel’s title there is shared with her daughter, Melody), The Little Mermaid III, the prequel The Little Mermaid: Ariel’s Beginning as well as The Little Mermaid television series. The Little Mermaid is loosely based on the popular fairy tale Den lille havfrue by Hans Christian Andersen, about a young mermaid who is willing to give up her life in the sea for true love and eternal soul. However, Andersen’s story has a not-so-happy ending compared to the Disney adaptation. In the film, Princess Ariel is the daughter of King Triton. She also has six older sisters, who also share the title of Princess. Like many other Disney princesses, Ariel is married to another royalty (although a different kind of royalty) as she weds Prince Eric. The marriage therefore makes Ariel a Princess Consort. In the original Little Mermaid film, Ariel is 16 years old. She is also the first Disney princess not to have been born human. She’s also the first princess to have an offspring of her own as she and Prince Eric have a daughter, Melody, who appeared in The Little Mermaid II. Belle is the fifth Disney princess and one of the lead characters of the 1991 animated film Beauty and the Beast, which is also the first animated film ever to be nominated for the Oscar Best Picture. Beauty and the Beast is based on a French traditional fairy tale Belle et la Bête written by Jeanne-Marie Leprince de Beaumont and published in mid-18th century. Like the original story, Beauty and the Beast tells of a beautiful young woman and the cursed beast who falls in love with her. In the film, Belle is 17 years old and the second princess not to be of royal descent, after Cinderealla When she marries the Beast, who becomes a handsome prince in the end, she becomes a Princess Consort. By the way, the prince’s name is Adam, although it is never mentioned in the movie. Belle is also the first Disney princess to have been the antagonist of her love interest. She’s also the first princess to have come from an actual country (France). Jasmine becomes the first Disney princess not to be of a European descent. She is also the first princess who is not a titular character in her film. Pocahontas, Disney’s seventh princess, the main protagonist of her eponymous film released in 1995, and its 1998 straight-to-video sequel. Pocahontas is the first Disney princess to have been based on a real historical figure (albeit loosely) and not on a fairy-tale character. She is the second princess not to be of European descent, after Aladdin’s Princess Jasmine. Pocahontas is also the first Disney princess to have two “princes” on the film — John Smith and John Rolfe, although only Smith is officially recognized as a Disney prince. Pocahontas is the daughter of the Chief Powhatan, which makes her a Chieftain’s daughter — which almost equates to being a Princess, although it is only in the sequel where she is accorded the respect of one. Her eventual marriage to John Rolfe, an English commoner, brings little change to her status or his. Fa Mulan is Disney’s eighth princess, and the protagonist of her self-titled film released in 1998, and its sequel Mulan II. She is the second Disney princess not to have been based on a fairy tale; rather, Mulan is based on a Chinese legend. Mulan, who secretly impersonates a male warrior in her place and in the process becomes China’s greatest heroines. To date, she is the only Disney Princess to have never held the title of princess either from blood or marriage. However, she is granted with the non-noble title of Imperial Consul. She eventually marries General Li Shang, who is also a commoner. Therefore, Mulan and Shang are the only completely non-royal pair in the Disney coupledom. Tiana is Disney’s ninth princess, and the lead character in the film The Princess and the Frog, released in 2009. Tiana has made history as Disney’s first African-American princess, and the first princess to have come from the recent era as the story is set in 1920s New Orleans. Tiana is a commoner who later gets to be married into royalty when she weds Prince Naveen, the eldest son and Heir Apparent of the King of Maldonia. This makes her the third to be married into the Princess life. Rapunzel is the lead character of the feature film Tangled (2010) and the short Tangled Ever After (2012). The film is loosely based on the German fairy tale of the same name. Like in the fairy tale, Rapunzel in Tangled is the maiden with the very long golden hair. She was born into the title and then separated from her parents’ custody when she was a baby, only to be reunited in her teens. Her hair, besides from being long and beautiful, also possesses magical powers. She is a strong-willed maiden and her weapon of choice is a frying pan. Princess PocahontasMerida is the main protagonist of the 2012 blockbuster film Brave, a Disney film produced by Pixar, thus making her the first Pixar princess. Merica is distinguishable because of her unmistakably flaming red and curly hair; she’s the second red-headed princess after Ariel. She lives in Scotland. Merida is the first Disney princess without a romantic male lead. Merida has a royal blood, being the first-born offspring and only daughter of King Fergus of DunBroch and Queen Elinor. She also has three very much younger triplet brothers.